DALLAS, May 22, 2017 /PRNewswire/ — Leading IoT market research firm Parks Associates will host the 21st annual CONNECTIONS™: The Premier Connected Home Conference this week, May 23-25, in San Francisco. The key technology networking event features analyst presentations on new consumer research and panel discussions with speakers from prominent companies such as Amazon, Google, Intel, Comcast and more. Press are invited to attend. 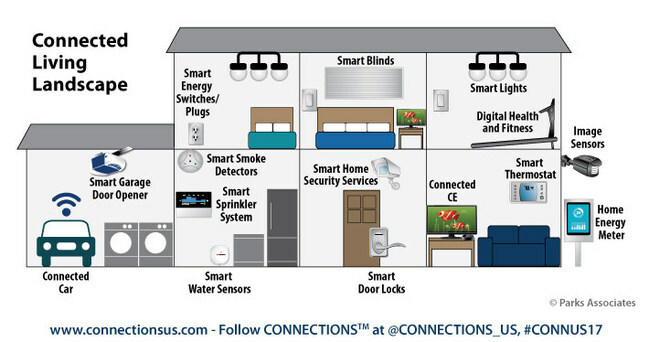 9:45 a.m. “Creating a New Foundation to Enhance IoT Experiences in the Home,” Rahul Patel, SVP and GM of Connectivity, Qualcomm Technologies, Inc.
Media can register at http://www.parksassociates.com/connections-presspass. Download the 2017 CONNECTIONS™ Media Sheet at www.parksassociates.com/conn-media. To schedule a meeting with an analyst or speaker, contact Holly Sprague at hsprague@gmail.com, 720.987.6614. Follow the conference on Twitter at @CONNECTIONS_US, #CONNUS17. CONNECTIONS™ is the premier connected home event hosting executives from the connected entertainment, IoT, and smart home industries. The event provides two pre-show research workshops highlighting Parks Associates’ consumer data and analysis and conference sessions focused on technology adoption and trends, product and service forecasts, evaluation of new business strategies, and recommendations about technology innovations, strategic partnerships, monetization opportunities, and value-added services. Contact sales@parksassociates.com, call 972-490-1113, or visit www.connectionsconference.com.